Denise Cartwright is a glowing example of a self-made entrepreneurial success story, who founded a multimillion-dollar skincare line that’s currently enjoyed in over 90 countries, worldwide. A trained cosmetologist, esthetician and yoga instructor, Cartwright saw every side of the beauty industry. During her decade-long hustle as a stylist, esthetician and makeup artist in salons, spas and photoshoots, Cartwright became especially intrigued by inflammatory skin disease (including acne, rosacea, psoriasis, and eczema). Today, this online business is known as Crude Personal Care: Cartwright’s line of plant-based skincare products with oil-cleansing at its core. Considering the beauty industry is estimated to be worth $445 billion (in sales) and in an era where the clean beauty movement is taking over retailer (and bathroom) shelves, Crude has earned its status as a skin and body care brand with a cult following. Not only is Crude free of toxins, synthetic chemicals and harsh exfoliants, but it’s also free of soap and detergent, and formulated with botanical ingredients instead. 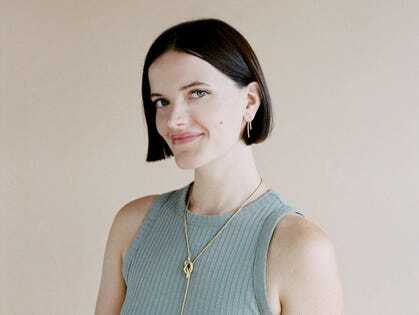 I spoke to Cartwright about her thoughts on the future of skincare, why we need to rethink the use of soap (and why soap is actually linked to sexist advertising tactics), and how customer testimonials have helped build her brand. Eldor: Can you please share your launch story? I know you built Crude from the ground up when you launched in 2014. Cartwright: I spent $30 on the ingredients for my first batch of oil cleansers, then kept reinvesting what I was making into larger and larger batches of product. Word spread quickly, and I helped more people heal their acne during those first six months than I had in the six years prior working as an esthetician! I’ve continued to bootstrap the business, and Crude has now generated millions in revenue without any outside funding or large advertising expenditures. In 2017, we launched the first truly soap- and detergent-free body wash available on the market. It received a lot of buzz as testimonials started to come out from our customers who used it to heal their eczema and psoriasis, and surprisingly, their chronic bacterial vaginosis and yeast infections. Eldor: I love that you’ve become a voice and thought leader about the sexist history of soap. Tell me about your take on soap and feminism. Cartwright: Regular soap bathing has only been common for the last century, becoming ubiquitous with the rise of mass marketing as early as the 1920s. Some of the first major advertising campaigns were led by companies like Procter & Gamble, who used soap ads in magazines and daytime radio shows (this is where the term “soap operas” originated) to persuade American wives that a daily, full-body soap cleanse was necessary for a happy marriage. Their advertisements worked: bathing with soap was normalized and it became a foundation for the beauty industry as we know it today. But our skin didn’t evolve to need soap, and research shows the repercussions of this invasive, inflammatory cleansing technique — and likely a link between our inflammatory modern skincare regimens and the rise of inflammatory skin diseases like acne, rosacea, psoriasis, and eczema. Through this process I realized that my skincare problems weren’t being caused by an inherent skin disorder or “skin type,” but by the chronic inflammation I was inflicting upon my skin with unnecessary synthetic cleansers and exfoliants. As soon as I gave those up, my skin healed itself; something it’s evolved over millions of years to know how to do. It was as simple as letting nature do her thing, not interfering with her processes. Eldor: Why have testimonials on the site been such an important focus for Crude? Cartwright: I think consumers are (rightly) more skeptical than ever about the products and ingredients being used in and on their bodies. People are aware of the problematic ingredients being used in their health and beauty products, and as that awareness increases, the “Clean Beauty” movement is seeing enormous growth. There’s also been an influx of dangerous, misleading and conflicting information about the products we’re “supposed” to be using, and customers no longer want to take the companies’ word for it. I don’t blame them. Product testimonials build trust in our customers and help them feel confident in making that initial investment. Being able to highlight real people and their real-life experience makes the entire industry better: reading others’ stories makes it easier to see that true healing takes time, and to trust your knowledge and experience about your own body. Eldor: What’s the best business advice you’ve ever received? Cartwright: To find your “Genius Zone.” I started seeing my business coach, Lyn Christian, about a year after starting Crude. At the time, I was running the entire operation: from making, bottling, shipping, and customer service to PR, social media, accounting, and more. She had me list every task I was responsible for on a separate sticky note, and categorize them according to the following categories: things I love doing and am great at (my genius zone); things I like doing but am not great at; things I don’t like doing but am good at; and things I don’t like doing and am not good at. Starting with the latter category, we spent a year delegating everything that wasn’t in my genius zone. Eldor: What are your 3 biggest tips for entrepreneurs looking to start their own company? Cartwright: 1- Follow your bliss. I know it sounds corny, but it’s so important to listen to your intuition and follow your passion! Be open to your path looking differently than it “should” and follow the things that make you come alive. 2- It doesn’t have to be perfect when you launch. We had a lot of kinks to work out of the business starting out, and I found a lot of value in being able to experiment with the brand and our systems on a small scale. 3- If you’re in e-commerce, build “free shipping” directly into your product cost. Customers want to pay for a quality product, but they don’t want to pay for shipping. I recommend building that into your product costs initially (if you can). Eldor: You had mentioned to me that “You didn’t see yourself as CEO of a business” and how since then, you’ve really stepped into your leadership. Can you share more about this? Cartwright: I had no intention of starting a business when I created Crude, and I definitely didn’t feel qualified to do so at the time. I had no business experience or college education, and had barely enough money to pay my rent. I can see now, though, that I was perfectly qualified to start my business, and my unconventional path in entrepreneurship has actually been crucial to Crude’s success. I’ve been fortunate to be able to surround myself with incredible, brilliant people who’ve helped me build and manage my business, and supported me in owning and embodying my role as CEO.